Spain win 2-0 and progress to the semi final of the European Championships. Again, this was a performance characterised by control and tactical discipline throughout although there were one or two moments in the second half when France attempted to gain a foothold in the match. Almost, but not quite. We have been here before, haven’t we? Del Bosque once more reverted to the false 9 system which is causing so much controversy with Fabregas replacing Torres. Laurent Blanc made four changes following the disappointing defeat to Sweden in the final group game. Koscielny replaced the suspended Mexes whilst Nasri, Ben Arfa and, most surprisingly, Diarra all dropped to the bench. Cabaye and Malouda were both reintroduced in central midfield. Anthony Reveillere made his first start of the tournament. Something of a lucky omen in previous games for France, Reveillere had yet to taste defeat on the twelve occasions he had started for les bleus. The most interesting feature of the French side though, was the deployment of both Reveillere and Debuchy on the right flank. A move clearly designed to prevent Alba and Iniesta pushing down the left side. It’s hard to avoid the view that Blanc thought long and hard about his formation, probably too hard. He moved beyond the point of balancing his team’s aspirations and negating the Spanish, and concluded with a line up designed purely to stop Spain. The inclusion of Debuchy almost as a right wing back with Reveillere behind was designed to combat the attacking thrust of Alba and his combination play with Iniesta. However, on the one occasion when Iniesta released Alba on the left, the resulting cross was converted by Xabi Alonso. The move also meant France lacked any sort of attacking impetus on their right and allowed Alba to push forward. The double full back idea has been successfully put into practise at Valencia by Jeremy Mathieu and Jordi Alba, the man who helped undo it tonight, with both players understanding their responsibilities defensively and attacking. Debuchy and Reveillere seemed unsure in the first half. Despite being the right sided midfielder, in theory, Debuchy dropped to deep from the outset, allowing Alba to position himself further up the pitch. The inclusion of Malouda in midfield was obviously designed as a link between midfield and attack but provided neither. The manner in which Alonso ran from a stationary Malouda for his goal must have alarmed Blanc. There may have been some tactical errors within the team but the players themselves must also share a portion of the blame for something as basic as failure to track a runner. With the use of the false 9 system, the requirement for midfielders to make forward runs is paramount. Spain have failed to do that so far with the exception of Fabregas. Tonight, the Spanish midfield all demonstrated their ability to move forward. The French midfield will be sorely criticised for their performance especially Malouda but it’s probably the first time in the tournament when the Spanish midfield have all offered higher levels of movement epitomised not only by Alonso scoring the opening goal but also by Busquets pushing forward and being the most advanced played at one point in the first half. The trend continued into the second half when Xavi operated almost as a second striker at times, tucked in behind Torres. But does the mobility, and the improved performance of Alonso, come with a downside? This was arguably Xavi’s weakest performance of the tournament. With Alonso more influential and Xavi moving further forward, we see the problems that were envisaged pre-tournament. Xavi made fewer passes tonight and when he was positioned slightly further forward, the incisiveness of the pass begins to fade slightly with more horizontal passing becoming prominent. 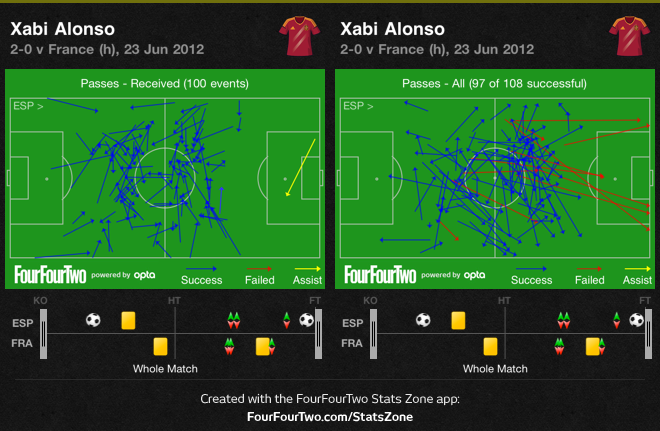 Alonso and Xavi need to operate in different areas of the pitch to both be effective. If Alonso steps forward, Xavi is squeezed. The Barcelona lynchpin remains unnervingly accurate with his passing through. This had the potential to be a key battleground in the game yet it never quite materialised. The French are very strong on their left side with Ribery stationed there and joined by the drifting Benzema. Against the weak link in the Spanish defence, Arbeloa, there was the possibility of success in this flank particularly as attacks would draw Pique out from his central comfort zone. Despite some forays, the attack seldom amounted to any real orchestrated period of pressure. In the defensive phase of the game, Ribery seldom bothered tracking back and remained high up the pitch, letting Arbeloa push forward. Once again, Alvaro Arbeloa had acres of space to himself on the Spanish right with France preoccupied with Alba on the left and Ribery uninterested in backtracking. Whereas Alba is involved in combination play with the midfield, primarily Iniesta, Arbeloa is often left isolated on the right and typically only becomes involved in the play via crossfield passes. The ball tends to be played to him as opposed to ahead of him meaning he can be closed down quickly. Arbeloa is therefore forced to turn inside or pass backwards. Opponents are not considering Arbeloa to be a threat. Against Ireland, Croatia and now France he has been left in space. Spain need to better utilise the space which opponents are presenting Arbeloa with. From an entertainment point of view, the second half was probably the dullest 45 minutes of the tournament to date. France tried to increase the tempo of their play but struggled to find any sort of rhythm in their play, failing to register a shot on target during the second half. Spain, showing signs of tiredness, appeared content to play within themselves but just above the level of the French. A number of substitutions in the second half offered potential to change the game yet had little effect. The introduction of Menez and Nasri for Debuchy and Malouda offered more attacking options for the French. Del Bosque responded immediately with two substitutions, Pedro and Torres replacing Silva and Fabregas. The move provided Spain with more of a direct threat and seemed sensible with the increased likelihood of the game being stretched as les bleus pushed forward in search of the equaliser. Pedro, rather than move to the right was positioned on the left perhaps to support Alba against the new threat from Menez and the attack minded Reveillere. The substitutions failed to have any real effect for either side although Spain began losing an element of control. Their possession dropping from 63% in the 60th minute down to 56% in the 80th minute. Indeed, between the 60th minute and 75th minute, France had 55% possession yet throughout this period, Spain always looked secure. The removal of M’Vila was Blanc’s last gamble in the 78th minute and it failed when Cazorla, a replacement for the tiring Iniesta, found space in front of the French defence, in the space which M’Vila had previously occupied, to thread the ball through to Pedro who was subsequently fouled for the penalty. The chart above illustrates where Cesc and Torres receive or attempt to receive passes. Whilst Cesc stays relatively deep in comparison to a conventional striker, Torres is moving towards the penalty area in most cases, operating off the shoulder of the last defender and always waiting for the through ball when he can utilise his pace. Opponents of the false 9 system will point to this as further evidence of the need for a striker. Torres helps stretch the French defence and pushed them further back whereas Fabregas operates in front of the defence. Even if Torres is not performing well, his presence on the pitch forces defenders into a decision. If they push high, there is always the chance of Torres breaking free therefore, the opponent recognises this and defends deeper. Whilst that is true, what is also important to note is the additional control which Fabregas offers. The introduction of Torres and a more vertical Spain resulted in possession dropping and a loss of control for a period in the match. Playing through balls to suit the natural game of Torres comes at a premium. Not all passes will be successful and the opposition then have the ball back and Spain need to press once more. With the movement of Fabregas and his combination play, Spain dominate possession and tire the opponent out. In the games against Italy, Croatia and France, del Bosque has made a change around the 60 minute mark, introducing pace and width to the side initially via Navas and now with Pedro. Spain control the game, suffocating you with possession and when you are beginning to tire, they introduce an element of verticality to their play. It’s becoming the del Bosque standard and allows the Spanish players to operate at a lower physical level during the match as they control the tempo. The players have greater recovery periods during the match whilst the opponents chase shadows. The Spanish players need this recovery time too. There are signs of tiredness now. Against both Croatia and France, opposition substitutions have created space for Spain to attack. The removal of Vukojevic in the 81st minute allowed Fabregas space to move forward unopposed and play the pass which released Iniesta against Croatia. Against France, the removal of M’Vila after 79 minutes provided Cazorla with time and space to pass forward to Pedro under no pressure. Teams set out defensive formations against Spain but the loss of a goal alters the paradigm of the match. The opposition coach must react, typically, by removing a defensive payer and replacing him with an attacking player. But so far this has not yielded results and only offered Spain more room to create attacks and ultimately, score goals. 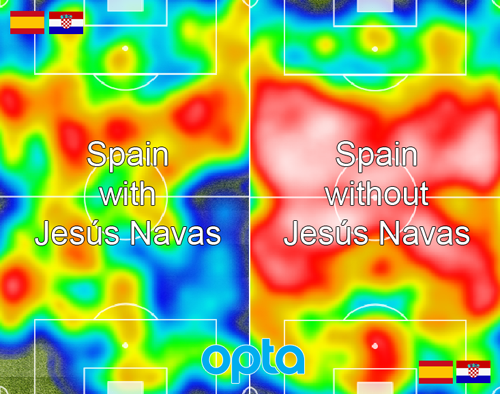 There were some issues for concern for Spain tonight but perhaps not what many people expected. Spain showed glimpses of fatigue. With two days less rest before they meet Portugal in the semi finals, don’t expect Spain to showcase expansive attacking football in the remainder of the competition. Although capable of it, this tournament now becomes solely about the result and the opportunity to make history. Spain will not change. They will continue to play the same way they have done over these past four years with an inherent belief that what they are doing is correct. It’s proven a highly successful tactic thus far. The question which Paulo Bento must ask is whether he changes tact or does have he have the same level of faith is his players which del Bosque shows in the Spanish? When the final whistle blew in Gdansk on Monday evening, the European Championships drew to a close for Slaven Bilic and his Croatian players. Some players accepted the applause from their supporters and returned the offer, whilst others swapped shirts and exchanged words with their friends in the Spanish team. At that precise moment, as the feeling of defeat sunk in for the Croatian players, there was the impending realisation that despite coming close to achieving their objective of escaping from the group stage, they had ultimately failed. Dejected, they stood still, exhausted as the victors took the applause. In the technical area, Bilic, who now departs the national team as a career in club management beginning with Locomotiv Moscow awaits, embraced Vicente del Bosque before the Spanish manager departed into the tunnel. There was, however, no celebration from the Spanish players on the pitch. The players simply walked off the pitch. Was this the first piece of visual evidence of the perceived lack of lack of hunger within the team? Players no longer showing emotion at the final whistle? Or was it simply an acknowledgement that the first part of the tournament had been negotiated successfully? The second part would prove harder. Spain had just beaten Croatia 1-0 to finish top of Group C and secure a quarter final berth but the level of performance in the group stages has polarised public opinion. The failure to use a recognised, conventional striker in the opening group match against Italy was the first step. Torres, Negredo and Llorente were all overlooked to accommodate Cesc Fabregas. Critics will point to the lack of a central focal point in the attack, the lack of penetration and the over indulgence on a raft of talented playmakers. The inclusion of both Xavi and Xabi Alonso in midfield necessitates squeezing Iniesta, Fabregas and Silva into the forward line. It’s a wonderful ensemble of attacking creative talent but does it come at a cost? What price the addition of cutting edge to your play? Yet the Spanish goal against Italy was vindication of the system and personnel. David Silva, occupying the false 9 role, dropped deep and provided the assist for Fabregas who arrived late into the penalty area. Llegada, the Spanish call it. The ability to arrive in the penalty area on cue from the second line of attack. Fabregas has demonstrated llegada in abundance at Barcelona this season. It’s also what Spain often lack. A midfield runner prepared to break beyond the forward line. The deployment of Iniesta in an advanced attacking role on the left removes this element from his game. Fabregas remains the one midfielder within the squad who is direct and offers vertical movement. Or “anarchy” as the technical staff at Barcelona labelled it. The Ireland match offered a glimpse into the future expanded European Championships, when smaller, plucky nations punch above their weight and qualify for a major tournament only to inevitably suffer a few hefty beatings before meekly departing. The game told us nothing new about Spain. It simply boosted the confidence of Fernando Torres via a brace. And so Croatia would provide the final opponents for Spain. Dependant upon your perspective, the hallmarks / failings of this Spanish side were evident throughout. Spain continued to pass effectively / without penetration. Their intricate passing seeking to pull the opposition out of position / whilst lacking width. The performances have not lived up to expectations yet upon closer scrutiny, does the performance not exceed the expectations of almost every other footballing nation? Is the burden upon the Spanish now so great that we pour over every aspect of their play seeking deficiency? Del Bosque, it seems, is not for turning. It must be recognised that, like all champions, Spain are faced with opponents raising their performance level when they meet la seleccion. Spain are increasingly faced with a defensive wall comprising 8 or 9 outfield players as the opponent lies in wait for the one or two chances they will have during the course of a match to alter its outcome. Rakitic failed to take that chance for Croatia and eventually, worn down physically and mentally, Jesus Navas struck. 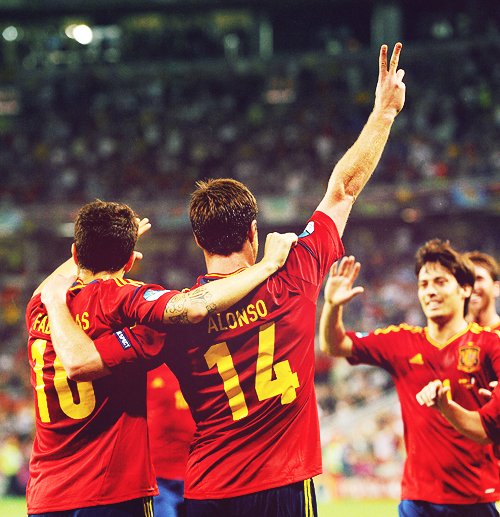 A goal of supreme creativity and one which epitomises Spain’s outfield play. Navas walked the ball into the net. Should another team deliver a performance on the technical level of the Spanish, it would be revered but familiarity has bred contempt in some quarters. We expect it of the Spanish and more besides. We demand demolition football whereby the opponent is thrashed. At this level of football, it is simply not going to happen. The statistics do not lie. On Monday evening Spain had 64% possession and 15 shots at goal according to Uefa.com. With 38 shots on target to their name thus far, Spain also lead the way in this department. And they also lead the charts for possession, pass completion, fewest goals conceded, most corners. And so a trip to the Donbass Arena in Donetsk to face France on Saturday evening awaits Spain. The sides have met on six occasion in competitive matches with les bleus winning five times. Spain’s best result being a draw. From the most recent meeting in 2006 when France triumphed 3-1, only Ribery, Malouda and Diarra remain in the French team. Yet a glance at the Spanish team sheet from that day reveals the names of Casillas, Ramos, Fabregas, Alonso, Xavi, Torres, Iniesta and Reina. This Spanish side has grown together, setting records and winning trophies in the process. On Saturday evening expect more of the same from Spain even though del Bosque has dropped hints of a more expansive approach. Navas continues to deliver from the bench. Against tiring limbs, his pace is a valuable asset. When you have chased and harried for 60 minutes, the sight of the Sevilla winger coming off the bench must be disheartening for left backs. The central trio of Xavi, Busquets and Alonso will continue to pass, pass, pass. Pulling the opponent across the pitch. Probing, seeking the gap to exploit the opponent. The fleet-footed running of Iniesta on the left balanced by the guile and trickery of Silva on the right, both seeking to break forward when the opportunity presents itself, to identify and find the surging run from Torres, creating the yard of space which could be the one opening for Spain to take the lead. The opponent chases, attempting to win the ball back. They gain possession momentarily before Spain squeeze them, pressing high and forcing errors in their passing. Spain have the ball once more and the opponent enters a vicious circle. Chase, gain possession, lose possession. Finally, with the opponent exhausted and drained, Spain stretch the game and begin to create chance after chance. It’s a relentless game plan and one which is now so well known yet counteracting it remains so difficult. It is the turn of Laurent Blanc on Saturday evening. Blanc has a number of key decisions to make for this match. The marauding forward runs of Debuchy on the right, a key feature for the French so far, will likely be reined in as France firstly attempt to halt Spanish attacks. An additional midfield partner for Alou Diarra, who has operated at the base on midfield alone, also seems a logical step for Blanc in this game. Yohan Cabaye may be deployed in a deeper role. This will provide a sound platform to build upon. It offers the new, as yet untested in the competition, centre back pairing of Rami and Koscielny, the necessary support. Les Bleus need a performance from Frank Ribery on Saturday evening both individually and collectively. He needs to push Arbeloa back and link with Benzema who has often looked isolated to date. And when the attack breaks down, Ribery must offer support to Evra. The questions over the positional sense of Evra will be closely examined as will his fitness when Navas eventually emerges. Can Benzema identify the weakness within his team mate at club level, Sergio Ramos? Throughout the season Ramos performed well at centre back which hinted at a new found level of maturity in his game. Yet the old failings have appeared again, the impetuous charges forward and being caught out of position against both Italy and Croatia. His athleticism saving him the first time, a dubious refereeing decision on the second. Benzema inevitably drifts to the left of centre where he will face club adversary Gerard Pique. Jeremy Menez will need to curtail the runs of Alba as Nasri becomes a casualty to injury, or the internal bickering depending upon your viewpoint, that has disrupted the French camp ahead of this contest. The Spanish defence has yet to be tested seriously in this competition. Can Benzema aided by Ribery and Menez provide a closer examination? A host of key personal battles across the pitch which will combine effortlessly to shape the outcome of this game. If Spain falter or if they struggle to defeat the French, the questions will surface once more. It will be asserted that del Bosque cannot see the problem, that he is unable to find the solution within a superbly talented squad. Or maybe he does see the problem. Maybe the stubbornness of one man, his refusal to see the problem and change it is actually the identification of perseverance. Maybe del Bosque’s reluctance to change is not due to some misguided sense of loyalty to the players on the pitch but a deep held belief that what he has instructed his players to do is correct. Maybe the worst thing for Spain to do, would be to change tact as del Bosque suggests. So what should the supporters who questions del Bosque do? What are our options on the sidelines as we query the inclusion of Fabregas and Silva but no striker in the starting eleven? When we ask why Llorente and Negredo have seen only a few minutes of playing time combined and will start on the bench yet again? We should listen to the man who scored the winning goal in the 2010 World Cup Final, Andres Iniesta. The final group game for both sides brought the usual list of permutations which could ensure qualification for either side. Amidst all the talk around the multiple outcomes and Italian cries of fair play, without any hint of irony, for Spain and Croatia to avoid a 2-2 which would see Italy eliminated irrespective of their result, a game of football threatened to break out. Almost, but not quite. Spain won with a late goal from Jesus Navas and, combined with Italy’s 2-0 win over Ireland, this sent Croatia home from Euro 2012. Del Bosque retained faith with the same players who had beaten Ireland with ease in the previous group game. Jelavic and Perisic dropped to the bench for Croatia to be replaced by Pranjic on the left of midfield and Vida at right back. Although appearing as something akin to a 4-2-3-1 on paper, Croatia switched to a 5-3-2 in the defensive phase with Srna dropping deep to cover for the forward runs of Alba. Vida subsequently tucked in as something of a makeshift centre back. Modric took up an advanced role just behind Mandzukic and sought to run into the channels, primarily to the left, either side of the central striker. The Italian Job – Part 2? From the outset, it was clear that, although Croatia were not following the same game plan as Prandelli had utilised with Italy, there were many broad similarities. Croatia fell into a back five when defending with Srna acting as more of a conventional right wing back than Strinic, who was more conservative, on the left. The midfield three stayed close to the defence and narrow to prevent Spain from passing their way through the midfield. Pranjic tucked in on the left which left Arebloa free but he was never able to take advantage of this space. In the attacking department, Modric and Mandzukic, to a lesser extent, both sought to run into the channels and find the space vacated by the Spanish full backs who occupied very high starting positions. Allied to this was the deliberate ploy of breaking the game up with fouls ranging from niggly to the downright cynical during the first half (Srna being the prime suspect here) which prevented Spain from developing any rhythm. Spain continued their trend at Euro 2012 of dominating possession but playing with little intensity during the opening half of the game. Alba and Arbeloa took up very high positions from the outset but Arebloa was seldom utilised on the right despite his space whilst Alba was closely watched by Srna. In the centre Alonso dropped between Pique and Ramos when Spain took possession, helping switch play on occasion but the passing was far too slow and ponderous. Silva frequently left his right wing berth and adopted a very central position further narrowing the game. As ever, the central area of the pitch was congested and the passing speed deteriorated as the half progressed. 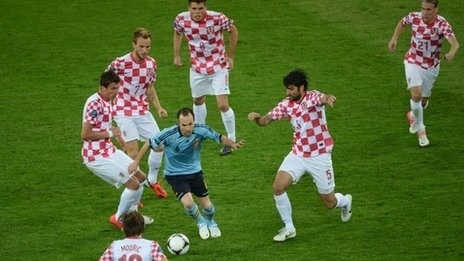 The one player who sought to eschew the incessant passing was Iniesta who, as demonstrated against Italy, would make darting forward runs towards the Croatian defence. Overall, Spain had 64% possession but they need to produce a final product to ensure overall control of the game. On the few occasions that Croatia won a set piece in the Spanish half, a number of players moved forward in anticipation of an aerial delivery into the penalty area. Spain are weak aerially and often appear chaotic when defending se pieces. Yet, this can often be an ideal opportunity for Spain to break down a defensive opponent. The transition offers Spain a number of possibilities if they can move forward at pace whilst the opponent is still moving back into position. These opportunities though are seldom grasped by the Spanish either through a lack of pace or through seeking an additional touch or pass when a more direct movement is required. The lack of directness is apparent in other elements of the Spanish play. David Silva is often the guilty party. In the 40th minute he was over indulgent in the penalty area, shifting the ball from side to side before his shot was blocked. In the 62nd minute, Spain had a quick counter attack but Silva took an additional touch on the halfway line instead of releasing the forward pass and was tackled, losing possession. Del Bosque made the first Spanish change with Torres exiting to be replaced by Navas in the 59th minute. Although this provided Spain with more width and variation in their game, the removal of Torres was arguably wrong. When Spain had opportunities they were arriving on the transition. Silva lacks genuine pace and always prefers to take an additional touch as discussed above. In addition to this, removing Torres meant Spain lacked a central reference point. If Navas beat his opponent and reached the goal line, who would he cross to? The substitution was a conservative move and demonstrated del Bosque’s belief in keeping control of the game. The heat map below demonstrates the worth of Navas in stretching the game and providing width and pace in the Spanish attack. Navas will attack the goal line and look for cut backs. It forces defenders to turn and move back towards their goal whereas normally the Spanish play in front of you. Even if Navas can be frustrating on occasion and his final ball can lack quality, he brings something else to the game which no other Spanish player offers. This contrasts sharply with the Croatian substitutions although Bilic had to seek a winning goal, a draw was no use to Croatia at this point. Had this been the first or second group game, Bilic would most likely have continued with the same game plan. Here, he had to seek a solution. Croatia moved from their 5-3-2 formation to a more positive 4-4-2 with the removal of Vida and Pranjic with Jelavic and Perisic coming on. With hindsight, perhaps Bilic should have made the move earlier in the second half rather than waiting. Del Bosque’s second substitution was the straight swap of Fabregas for Silva which must leave Fernando Llorente and Alvaro Negredo wondering why they are in the squad. Another conservative move and one which seeks the control of the midfield area at all costs. Supporters of del Bosque will claim the goal exonerates his decisions and to a degree there is truth in that. However, the goal arose because Fabregas had space to move into with Croatia abandoning their more circumspect formation as they chased the game. With neither Vukojevic now off the pitch and Rakitic also pushing forward, the Spanish could run at the Croatian defence. The goal itself was superbly crafted and executed with a deftly lobbed ball through to Iniesta who square for Navas to walk the ball into the net. Spain are through and publicly, the squad and staff are likely to confirm that the first goal of the tournament has been achieved but privately there must be reservations over the manner of their play at times. The ball was recycled far too slowly and the lack of width has still not been fully resolved. Del Bosque will be criticised for the performance in the Spanish press. Bilic set his team out well and can take credit despite the defeat. Spain won by remaining true to their beliefs in tiki taka but the margin for error tonight was virtually non-existent. They could easily have drawn or even lost the game. The easy games for Spain, as such, are over. More demanding and tougher challenges await when there will be no margin for error. Ireland become the first team to officially leave Euro 2012 after a comprehensive 4-0 defeat at the hands of the reigning European Champions. An incredibly one sided game, with the exception of boosting the confidence of Fernando Torres, it’s difficult to assess what we actually learned from this performance from a Spanish perspective. For Ireland, a side who entered the tournament on the back of a belief in the highly systemised approach Trapattoni had instigated, the manner of the defeat will be highly demoralising. Spain made one alteration to the side which started against Italy in the opening group match. Fernando Torres returned to the side at the expenses of Cesc Fabregas who dropped to the bench due to concerns over a niggling thigh injury. The change in the line up meant a slight change in the system. The false 9 experiment was abandoned with Torres becoming the reference point for the attack and Silva predominately on the right, although still narrow, throughout. Likewise, Ireland made one change to their starting eleven who lost 3-1 to Croatia. Simon Cox replaced Kevin Doyle and dropped in behind Robbie Keane who was used as the main striker. In some games, though seldom at the highest level, there is no tactical discussion. One side is simply vastly superior to their opponents, both individually and collectively. Tonight was one such occasion. Despite their determination and workrate, qualities which are admirable and which can fulfill part of the journey towards success, Ireland were outclassed. Juanma Lillo, the ex-manager of Almeria and an influential figure in the career of Pep Guardiola claimed that results simply reflect the final outcome of the game. They do not tell you what occurred during the game. I imagine that Lillo was reflecting upon games when one side dominates yet their opponents sneak a goal and hold on for a 1-0 win. I doubt he had games as witnessed tonight fresh in his mind when he spoke those words. For the scoreline tonight does not accurately reflect what occurred on the pitch. Spain had 75% possession with 27 attempts at goal. During the course of the match they completed 860 passes setting a new European Championship record. Unsurprisingly, Xavi was the epicentre, recording an individual record of 136 passes. The scoreline did not reflect accurately the gulf in class. The Spanish wanted the surface watered prior to kick off whilst the Italians, predictably, refused. The result was a dry surface which hindered sharp passing. Tonight, with rainfall in Gdansk, the pitch was slick from the outset which immediately aided the Spanish. In the 3rd minute, Iniesta moved between the Irish lines which had opened up as the midfield pressed high yet the defence dropped off and fizzed a ball along the greasy surface to Silva. Despite the intervention of Dunne, Torres stole the ball and scored with Ward, a bystander, and Given, possibly carrying an injury, unable to respond. Fernando Torres – Back tonight. Back for good? A second early goal conceded by Ireland in two games and one which prevented any defensive stand against la seleccion. Had Ireland held out longer, perhaps Spain would have become frustrated or nervous although this seems wishful thinking on the part of the Irish. Yet despite this setback, Ireland continued to press higher up the pitch, attempting to prevent Spain from building attacks. Casillas was forced to kick long from a goal kick in the 10th minute. Yet gradually, the intensity of the press dropped due to the sheer physical exertion required and the position of the team fell back too. The defensive line moved back and the midfield followed until Keane became isolated and was left foraging for scraps from long punts towards him, often caught offside. Damien Duff was fouled in his own penalty area in the 31st minute after backtracking and clearing the ball. Ireland could not get up the pitch. Simon Cox had been deployed as a link between midfield and Robbie Keane in attack yet never really offered either option. In the defensive phase he should have dropped between Andrews and Whelan quicker. Instead, the Irish duo were being overrun as the first half progressed. A situation which was only going to be exacerbated as the game progressed and fatigue, both physical and mental, developed. This contrasted sharply with Spain who pressed in a coherent, and importantly, hungry fashion throughout. Torres central starting position provided the shape needed with Silva dropping right and Iniesta to the left. With the full backs high, Spain closed down their opponents quickly and Ireland lacked the technical ability to play out from defence. The end product of this aptly displayed by Shay Given being Ireland’s 4th best passer. Spain had been too narrow against Italy but here the full backs adopted very high starting positions especially Alvaro Arbeloa. Whilst much has been expected from Jordi Alba in this tournament, it was Arbeloa who offered himself as a constant option, hugging the right touchline and the recipient of numerous crossfield passes early on as Spain probed. In the 7th and 28th minute, Arbeloa managed to get in behind Ward and latch on to Xavi passes and head back across goal. Ward was tucking in to offer support to his central defenders but McGeady was offering little defensive protection ahead of him as he was drawn into the centre of the pitch. A predicament created by Spain always having at least a 3 vs 2 in this area. Ireland completely failed to respond to this and Arbeloa was still enjoying freedom late in the second half, enjoying two strikes at goal. The early goal possibly adversely affected Spain. They fell into a lull, content to dominate Ireland but lacking any cutting edge or penetration and passing horizontally around 35 yards out from the Irish goal. The intensity of the passing dropped too and Xavi could be seen shouting at Arbeloa to move the ball quicker. Against a limited opponent such as Ireland, there is no real concern but Spain simply will not have this luxury against others in the tournament. Is del Bosque trying to tire out his opponents by dominating possession and then striking as the game moves on? Pique – Central defender or wannabe winger? It’s a dangerous tactic as the defence is unsteady on occasion and suspect to aerial attacks. The calming influence of Puyol has not been replaced. Spain increased the tempo noticeably at the start of the second half and the early goal by Silva finally killed the game as a contest. Almost typical of Silva, he initially chose not to shoot when presented with an opportunity, working the ball onto to his favoured left foot approximately 8 yards out before rolling the ball into the net. Other defenders will not be as generous as the Irish. From this point onwards, it was more akin to a training game for Spain with Ireland left chasing shadows across the pitch. The 3rd goal resulted from an intensive, yet haphazard, moment of pressing from Ireland resulting in a high line and a lack of shape which Torres exposed. The final goal for Spain was an example of the mental fatigue which had enveloped Ireland late in the game. A quick corner was played in low to Fabregas who spun and relied on power to beat Given from an acute angle. Fabregas was the only Spanish player in the penalty area when the corner was played to him. There were six Irish defenders, all of whom failed to react until it was too late. For Trapattoni and Ireland, one game remains to salvage some pride before some of the stalwarts of this side move on and the team enters a rebuilding phase. It must be borne in mind, through all of the criticism of Ireland above, that ultimately Spain are simply a much better side but the manner of the goals conceded will concern Ireland. If questions persist about deploying a 4-4-2 against Spain remember that USA and Switzerland employed such systems and won. 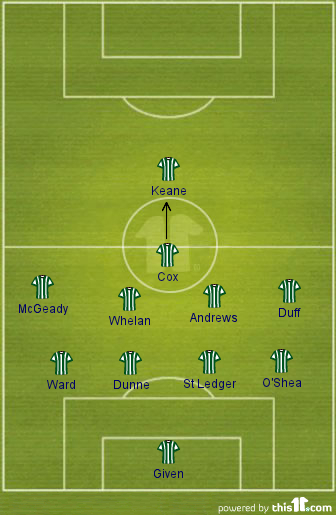 For all of the criticism that will be aimed at Trapattoni, the players must take their share too. The defeat tonight did not end Ireland’s European Championship campaign, the loss to Croatia did. The damage suffered in Poznan was irreparable. For Spain, it’s a confidence boost for Torres. Not only the goals but the faith demonstrated by del Bosque. Javi Martinez and Santi Cazorla secured some playing time also which will be useful as there will be the need for rotation at some point. Croatia now await and the potential for yet another significant clash on the wings with Jordi Alba likely to face up against the adventurous Dario Srna. Win the game and Spain win the group but it’s unlikely to be anywhere near as simple as tonight.